You win some and you lose some. Unfortunately, for those who choose to get tattoos of impermanent things (basically anything but death, taxes, your kids&apos; names, and Chinese characters that don&apos;t mean what you think they mean), you lose twice. And yes, your girlfriend&apos;s name definitely qualifies as "impermanent." Sorry to burst your bubble. 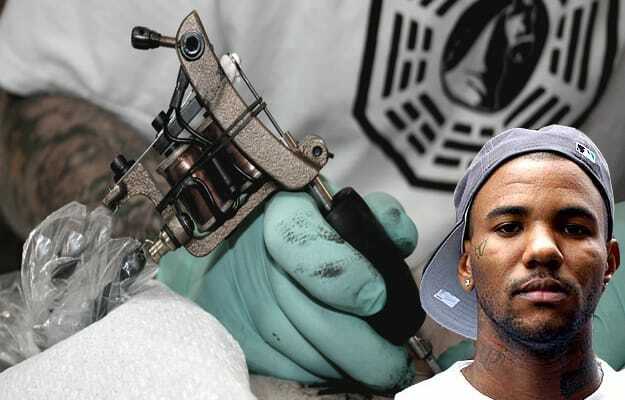 The brewing bromance between Pharrell and Game led the latter to ink P.Will&apos;s record label logo on his arm. We&apos;ve seen how these turn out—check out the G-Unit tattoo seen directly above the Star Trak one, for example. The ex-Charles in Charge star got a tattoo commemorating the weight loss show, the second time he appeared on it. Weight fluctuations being what they are, we&apos;re sure dude will be happy when he gains 50 pounds and the tat is twice as large. "What, you mean my boy band&apos;s not gonna stay together forever. It&apos;s all good, I&apos;ll just turn it into a sun tattoo! Sun tattoos are cool, right? Right?" 50&apos;s Phoenix protege recently pledged his allegiance (again), perhaps as a reminder to his boss that his debut album, slated for &apos;08, still hasn&apos;t dropped. We&apos;d rather not think what Young Hot Rod might stoop to if his LP gets pushed back another year. Let&apos;s give Nic the benefit of the doubt and say she got her "Virgin" tattoo when she actually was one (which, yeah right), didn&apos;t she think she might want to bump uglies at some point? Classic celebrity thought process fail. Apparently Baldwin&apos;s kids are big Hannah Montana fans, and Ms. Montana herself (government name: Miley Cyrus) promised Steve a cameo if he got a "HM" tattoo. He did, but his appearance on the show is still forthcoming (as in Nevruary). Damn son, at least all the dudes that got G-Unit tattoos got played by a grown man. Queens&apos; gully-est rappers joined G-Unit and, following protocol, Prodigy tatted the movement into his right hand. Mobb Deep eventually got thrown under the bus, for content that didn&apos;t sell aggressively enough. Not knowing his sneakers were going to end up kicking rocks, currently unemployed baller Stephon Marbury tatted his logo on his head during the "prime" of Starbury&apos;s short shelf-life. Just like his presence on any team, the tattoo brought easy promotion and major headaches, but at least he can grow his hair out to cover it up. As far as we know, Crooked I is still a member of Slaughterhouse, but we gotta admit, we missed the press release announcing he&apos;d joined "Slaugterhouse." Spell check is a beautiful thing, homie. In this planned tat, Game whores himself for the video game industry from Atari to X-Box 360. If he goes through with this, someone should let him know he might end up playing himself in the future (ayo!). RELATED: Complex&apos;s Top 100 Brands of the 2000s!